Things move fast in the roleplaying world. A few days ago, GW announced that the license to WFRP (and WH40k) has passed to Fantasy Flight Games. I don’t know anything about FFG, but what I’ve read seems promising. The fact that WFRP will continue to be officially supported in any capacity is excellent news for all of us. I wish FFG the best of luck, and congratulations. I can’t wait to see what they come up with. The excellent run of Black Industries is soon to come to an end. Dave Allen announced here thatÂ BI is going to fold this year. Apparently The Thousand Thrones, which I wrote a chapter of, will be the final WFRP product released. My scenario entry, Dead Ringer, won first place for the Contributor’s Section of BI’s 2007 Scenario Contest. A copy of the Collector’s Edition of the Art of Warhammer is winging its way to my doorstep even as we speak. Apparently only 100 of these have been printed; I can’t wait to get my grubby little hands on one. Just What Have I Been Up To, Anyway? It’s been a long while since this site last updated, but I have been working on WFRP, I promise. The Scenario Contest over at Black Industries has been occupying all of my time of late, and I finally finished my entry. It’s about a man who was wronged by some corrupt people in authority, and engages in complex machinations to obtain his revenge. The PCs must thwart his attempts at poisoning an entire town (and most likely them as well). Plenty of puzzles, a group of thugs, and the same corrupt men stand in their way. Look for it at the 2007 Scenario Contest Site. It’s titled “Dead Ringer,” and can be found about halfway down the page. To whet your appetite, I’ve placed a picture of the cover behind the fold, expertly penciled by TJ Adamowicz and digitally painted by Alfredo Lopez, Jr. Sorry for the lack of updates. Life has been quite hectic over the last several months. My previous post on solving the problem of unlimited healing is itself problematic, because it would increase the likelihood of rampant chaos effects with healers, primarily followers of Shallya. Since witch hunters would not tolerate the existence of Shallyan priestesses who, in their eyes, routinely traffic with the forces of Chaos (as evidenced by common chaos manifestations), it does not seem to make sense to attempt to limit the casting of healing spells by increasing the likelihood of calling down the curse of Tzeentch. So, back to the drawing board. Fortunately, I may have hit upon a simple, elegant solution that does not involve Chaos at all: healing spells tamper with the recipient’s life force, and thus should come at some cost. I propose that every time a successful Heal spell is cast upon a wounded PC, that PC suffers a -10% to his or her Toughness score. Josef sent me revamped versions of the main crit charts, which follow the lethality of the chart in the WFRP rulebook and should shorten combats considerably. I’d like some feedback on these charts, because if there’s enough call for it I’ll offer similar versions of my own. You can find them at the usual place in Josef’s section. The sketches keep rolling in. 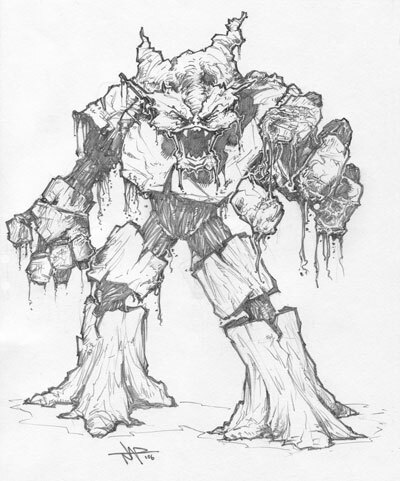 This time TJ submits a creature the PCs may (or may not) meet up with at some point during the first installment. Internet fame and fortune await the first one to guess what this creature is. Anyone have their Old World Bestiary handy? We are now listed on the “Top 50 Warhammer Sites,” of which there are currently … six. Does that mean Winds of Chaos is in the top 6 Warhammer sites on the planet? You are currently browsing the Winds of Chaos weblog archives.